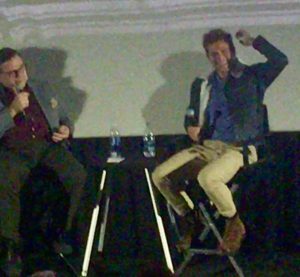 Bradley Cooper and Oliver Platt were in Chicago, IL at the AMC River East Theater on the evening of September 17, 2018, to discuss the film “A Star is Born.” Cooper directed the film, has screenplay credit as well as co-stars with Lady Gaga. The private screening consisted of press and SAG members. The Q&A session lasted over 30 minutes and was insightful into gaining Cooper’s perspective. 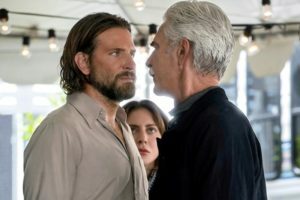 The interview has been condensed and features the audition process, Cooper’s directing influences, the filming of certain scenes, Cooper’s explanation of why he chose this story, and how he learned to lower his voice. Oliver Platt: How did the audition process happen with you and Lady Gaga? Did you, read a couple of scenes together? Bradley Cooper: No, it’s all instinct. Elia Kazan in his autobiography said, “I don’t audition actors, I take them for a walk around the block.” I just so subscribe to that, because an audition process is so tense, you’re not getting the best of a person’s talent, normally. We sang a song right away, within 10 minutes, I said, “You know the song, “Midnight Special, “ a folk song? It just felt so comfortable, and for some reason, our voices worked. And that was the beginning of the journey. Bradley Cooper: Two people had a lot to lose. This was a big swing and the fact that we were both trying something for the first time, I think necessitated reliance upon each other in a way that wouldn’t have been the case otherwise. Oliver Platt: Tell us about the first time that you got on stage to play live, and you had to do a few takes in front of all of those people. Bradley Cooper: So, we went to Glastonbury Festival in the UK and went on the stage there in front of 80,000 people; that first scene is 8 minutes at Stagecoach, we did only two takes; yeah, we did that song twice. So that allowed this level of authenticity that I couldn’t have replicated if I tried to manufacture within a budget. Oliver Platt: Have you wanted to direct for a long time? Bradley Cooper: Yeah, since I was like 12, yeah. I mean, I just never had the guts to do it, and I started this when I was 39 and time is running out, and if I don’t try this, I’m never going forgive myself, and it was the perfect sort of matching of two things. I had all these things I wanted to investigate like family and trauma as a kid and what happens when two people actually love each other. There’s not infidelity; they actually love each other. And it’s still so hard. I also wanted to investigate finding your voice as a human being and your identity and what happens when the world tells you that you don’t have a voice. So that’s where these two characters came from, and then I wanted music involved with it, and Warner Brothers had this property, “A Star Is Born,” and it felt like the perfect match. And so it was a really great structure with which I could tell these personal stories. Oliver Platt: Because that’s also another thing that’s so remarkably ambitious of what you do for your first movie you’re directing is to direct a classic. Oliver Platt: My guess is you enjoyed the hell out of the process. Bradley Cooper: Yeah, I really did. It’s the most fulfilling experience I’ve ever had artistically, no question about it. And I’ve had wonderful experience; I hope I get to do it again. Oliver Platt: Yeah. You, Bradley Cooper, have worked with some of the best directors. Which directors influence you the most? Bradley Cooper: Everyone I’ve worked with is an influence. The same thing with the music, there’s not one sort of musician I was trying to… work off of. I would never have been able to make this movie if David O. Russell hadn’t allowed me to be such a part of his process. Jay Cassidy who edited the movie with me, I met him on “Silver Linings Playbook,” and I was able to be in the editing room every day for that movie and also with “American Hustle.” It was like going to film school. And I also, what I learned from David was pacing. We shot “Silver Linings Playbook” in 32 days, and there’s something really wonderful about there being a really, a lot of pressure on time. Oliver Platt: How did you get Sam Elliott’s voice? Bradley Cooper: You know, that was the hardest thing, by the way, lowering my voice. That was brutal; I worked with this great dialect coach, Tim Monich, and the first two months of working, I could only do it with my head looking down. I thought, “Well, this is not going to work.” It really hurt my throat, but then by just working on it, finally it started to work itself into my body. But that was pretty difficult. The voice changing for Jackson’s character was because I had read Bruce Springsteen’s autobiography, which I highly recommend if you haven’t read it, or listen to it on tape because he does it on tape which is great, he reads it. He talks about stealing his father’s voice when he was a kid and I always to wanted to be my dad.